Who's up for another fan extra? I'm working on a sequel to The Alien Mind, but in order to do so I needed to back track some math to try to figure out how many kids are on the scene, how many are needing to be found, and which ones are available to be rounded up from other scenes. 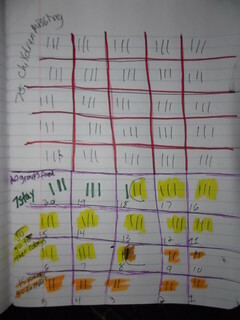 This got so complicated I needed two sheets of notes and three tally mark charts; talk about some writer problems! It was so confusing pulling this all together that I thought you all might enjoy a bit of a peek! When Aun is attacked the Children are sent off to safety in 10 ships each with a 20 person capacity. 50 Aunantet join them. Because Rivi and Ankh stay behind on Aun to make sure the children's ships get off the planet safely that leaves 148 children to be divided among the 10 ships with two seats empty. Later the book says the children and Aunantet decide to split up into 45 smaller groups to better evade the Aruk. It does say 75 of the kids are left to be found. So working backwards... if you take the 75 kids out of the picture first and leave the 20 groups that end up found you get 52 kids. Rivi is put in charge of relocating 15 of those groups (so 42 kids out of the 52) and we are also told that 30 of her children decide to go to the other colonies. I'm assuming here that the Aunantet took charge of relocating most of the youngest ones thereby deciding to send them to Mars. So with 30 of Rivi's group gone to the other colonies that leaves 5 that were Rivi's (out of those youngest 15) that go to mars and 7 of Rivi's end up staying on Aun! So... what trouble can I get these children into now? If you'd like to see me finish this second book so you can find out what happens next, comment in the blog comments with #finishthatstory !